Zumba is a great dynamic core workout – and it’s fun! Zumba works your entire torso section for stronger, more defined abs and back, but it is also a comprehensive workout from your head to your toes. Everyone can take a Zumba class, whether you know how to dance or not! You’ll learn how to dance without even realizing it. This is the exercise in disguise – you can expect to burn 500-1000 calories in an hour. 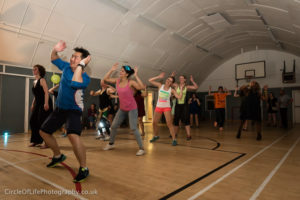 Zumba classes usually run for one hour and cover a range of dance styles – mambo, cumbia, merengue, cha-cha and, sometimes, belly dancing and hip-hop. Zumba training teaches instructors specific guidelines but gives them the flexibility to design classes in their own style. You won’t only look good, you’ll feel good! It is imperative you complete the Health Questionnaire prior to class. Why not complete in your own time and drop-in ready to PARTy with Adrienn. We do have FREE WIFI access and can assist you in the studio instead. In such cases, please arrive 5-10 mins prior to class. Should you have any health concerns, call or email us directly. In cases of injury, pregnancy please note we need you to get the all clear from your GP.